IETE ATC programme of 2016 held at IETE HQ, New Delhi, participation as an Speaker/awardee. 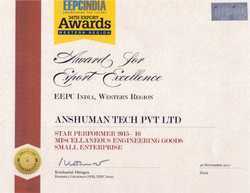 IETE Award to Anshuman Tech Pvt. 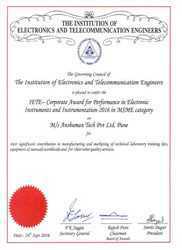 Ltd : Corporate Award for Performance in Electronics Instruments and Instrumentation - 2016 in MSME category for their significant contribution in manufacturing and marketing of technical Laboratory training kits equipment & manuals world wise and for other quality services. 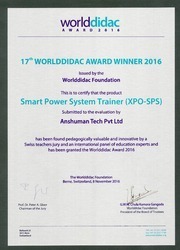 We are pleased to inform all stakeholders that our [SMART POWER SYSTEM TRAINER ] MODEL : XPO-SPS Trainer has been adjudged as winner of “WORLDDIDAC” award 2016 in competition with many companies of European and Asian countries. 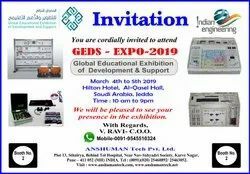 Our product is awarded for excellent Quality and innovative aspects useful for teaching and learning solutions. This therefore justified higher cost of XPO-SPS. 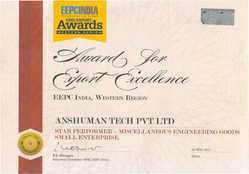 EEPC Award for Export Excellence : Anshuman Tech Pvt. Ltd. Pune has been awarded as Star performer in Export excellence by EEPC India, Western Region for the year 2014-15. 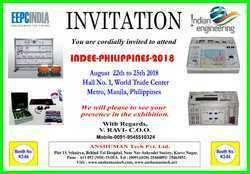 Anshuman Tech Pvt Ltd. has awarded for Excellence in Electronics for 2016-2017 by Electronics Industries Association of India (ELCINA-EFY GROUP), Dated 14 September 2017. In recognition of their outstanding performance in Export (Certificate of Merit). 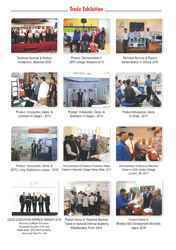 ATPL is Bronze Sponsor in ICPS 2017, International Conference (7th) on Power Systems 2017“, Pathways for grids of the future”(21st-23rd December 2017). 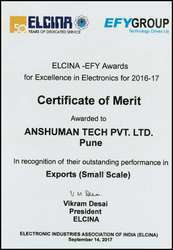 EEPC Award 2017, for Export Excellence : Anshuman Tech Pvt. Ltd. Pune has been awarded as Star performer 2015-16 [Miscellaneous Engineering Goods Small Enterprise] in Export excellence by EEPC India, Western Region for the year 2015-16. 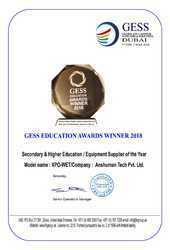 ANSHUMAN Tech Private Limited., Pune Tech has awarded for Secondary & Higher Education Resource Equipment Supplier of the Year 2018 at GESS DUBAI 2018 for our Model XPO-WET (Wind Energy Trainer) Date : 28 February, 2018. 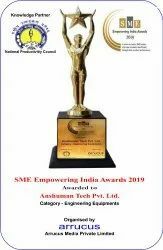 SME Empowering India Awards 2019, Awarded to Ashuman Tech Pvt. Ltd.